summer, I am happy to have my schedule back and get back into a routine with my job and the kids. Between, school, soccer, ballet and all the rest of my mommy duties I've had to literally get a hold of my calendar and get back on track. Summer can leave you feeling amazing, but for me, it can also make me feel a little all over the place - on my calendar at least! I've shared my struggle with going to sleep late with you guys in the past. It's been an ongoing cycle for the past couple of months now. Working from home for me is pretty much a 24/7 job and it’s really hard for me to shut down at night and truly rest. Most times my creativity starts flowing late at night and I can't sleep, so I start working.... and in turn, I go to sleep super late; 1AM, 2 AM, not kidding. Of course, this leads to feeling extra tired in the mornings but I still have to be on point for my two kids and run my business. This routine hasn't been the healthiest for me so I was happy when I found out about a drug-free way to go to sleep. 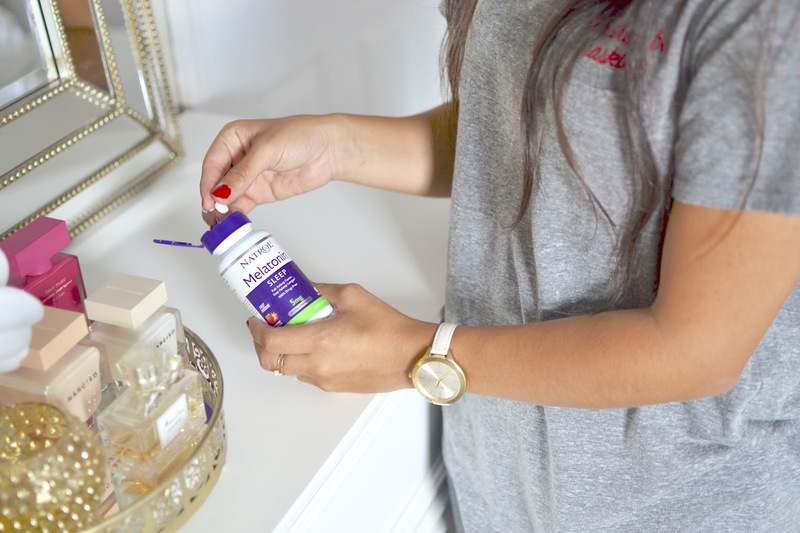 Natrol® Melatonin Time Release combined with Vitamin B6, provides an initial dosage of Melatonin to help you fall asleep fast, then slowly releases additional Melatonin throughout the night to help you stay asleep and wake up feeling refreshed. I am a firm believer that in order to feel your best, you have to get a good night's sleep. Sleep health is so important for everyone. It can take a toll on the mind and the body and pretty much trickle down to your mood, stress and how you handle your day. Since using Natrol Melatonin I've been feeling amazing, waking up feeling refreshed and happier. 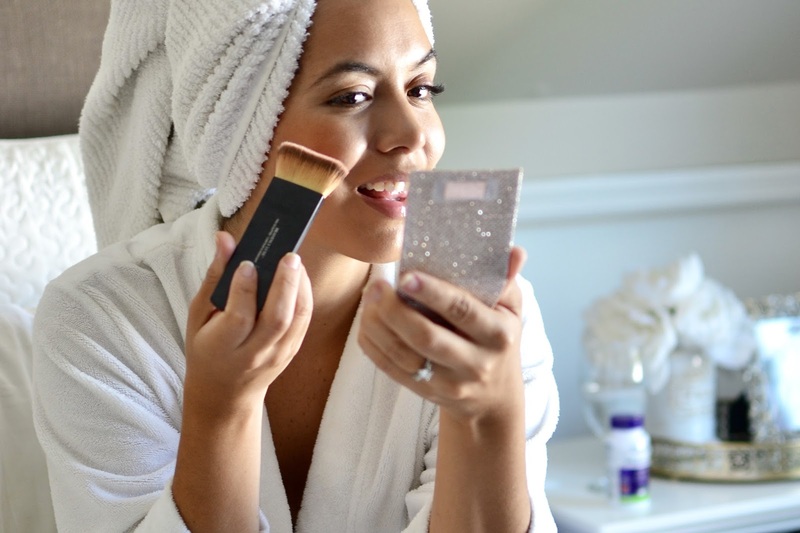 Getting ready in the morning has been amazing, I feel more rested and ready for the day. Having Ben go back to school was actually a great thing for me, as much as I didn't want summer to end. It forced me to get back on a schedule while also forcing me to take better care of myself so I am able to keep up with my family's day to day. I am not the type of person who takes pills for much of anything at all, but I feel comfortable taking Natrol Melatonin because it's completely drug-free and non-habit forming. What I love most is that it helps me fall asleep fast, stay asleep longer, and wake up feeling brand new. I am really happy to partner with Natrol to gift 2 winners a Natrol prize pack. All the details are below. Share your #MomSupplies on Natrol’s Instagram, Twitter or Facebook with #SleepOwned and #MomSupplies to enter! 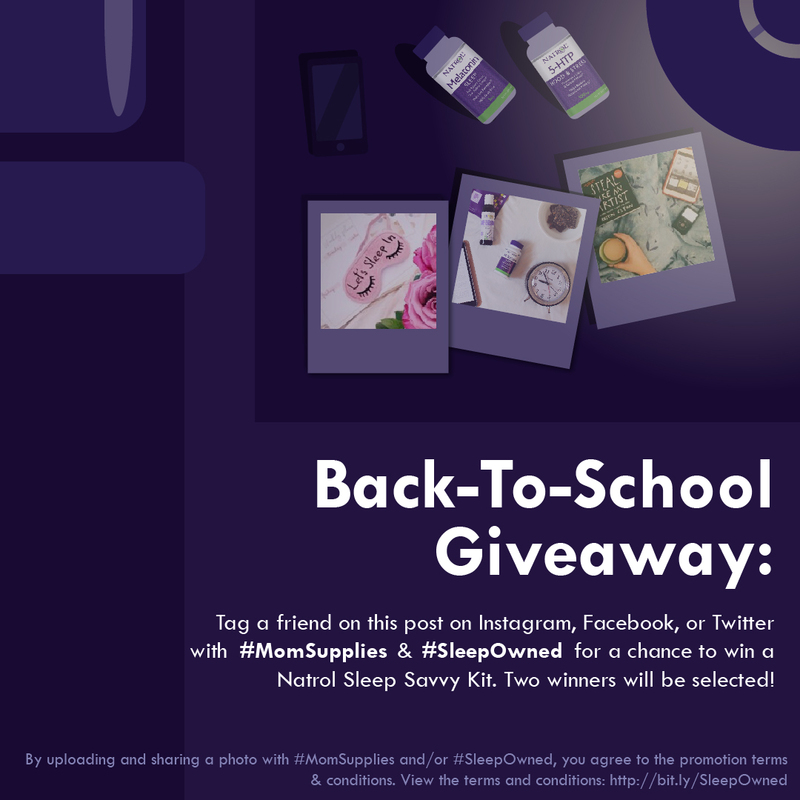 The Sleep-Savvy Wellness Kit has been valued at over $300 consisting of the core back to school Natrol product, Melatonin & 5-HTP, and luxury wellness goods. For more information, the Terms & Conditions are published to Facebook. The mandatory hashtags for this are #SleepOwned, #MomSupplies and #NatrolxRedbook. Here's to great sleep and happy (and crazy!) mornings! I hope this post was as helpful as it has been for me. Remember to take care of yourself, mommy! We are the fuel in our families and we can't forget to take care of our minds and bodies too. Happy back-to-school season and may your kids have a healthy and successful school year! This post is sponsored by Natrol. As always all opinions are my own.